Hurdles in getting rich, What to do to become a rich, Where to invest to become a rich, thinking of an ambitious person and a common person, investment segments to become a rich. Do you want to know what are the mistakes which a common person do and deprived of from the monetary powers? They don't have respect for themselves- Because of this they are not giving importance to their own qualities. They always look on others for success. They are unable to market their own qualities. They always engage in impressing others- Due to this also their life become hell. They don't want to do things for own satisfaction. But always try to impress other and due to this they are unable to get the real success. It is necessary to live for own self and to satisfy our self to become a real rich. They Are Pompous- They spend too much on useless things and this behavior keeps them away from the money. And later on they become poor and unable to fulfill the basic needs too. They Pretend like a Rich Man- If you don't have the power and try to spend like rich then definitely you are taking yourself towards failure. They don't have ambition- Without aim it is very difficult to move in this life successfully. So Ist decide aim and you will automatically get the way to move. They don't know the way to invest. Read Here About 16 Tips For Getting Rich. When monetary powers comes to a common person what he or she does?, let's see. He or she spend in luxuries, in eating, in wandering here and their, in fulfilling hobbies, buying vehicles, jewelries etc and thus lost all the money in a very short time. When monetary powers comes to an ambitious person he or she invest it in somewhere to gain more and to multiply their funds. In this way they invest but a common person spend. Investment is done to increase the money power in long run but expenses are done to enjoy the current power only. So if you really want to be a rich person then be an investor an work smartly. Don't behave like a common person. Now a Question arises that where to invest? You can invest in Stocks. You can invest in Gold. You can invest in commodities. You can invest in real estate. You can invest in Bonds. You can invest in any business to get good returns. You can make fixed deposit to get a secure return. You can invest in mutual funds. You can make insurance policies. You can invest in learning new arts to en-cash it in future. So to be a rich is not as easy, you have to think positive, you have to think like a rich person, you have to invest, you have to make yourself strong. So give aim to your life and live a healthy and wealthy life. 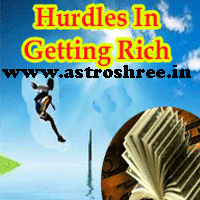 Use astrology to know about your right direction, use astrology to know about your qualities, use astrology to know about your golden period, use astrology to know about what to do to get real success. How To Make Money Without Job? Hurdles in getting rich, What to do to become a rich, Where to invest to become a rich, Thinking of an ambitious person and a common person, investment segments to become a rich, How to make money by changing our mind?